Many tech devices contain elements that harm our environment, like lead and mercury. Help us keep this hazardous e-waste out of the landfill by recycling old electronics instead of tossing them in the trash! 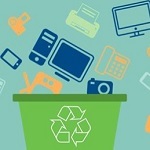 Integrated Building Systems invites all neighbors to bring old, unwanted, and non-working electronics to their 7th annual Earth Day Electronics Recycling Drive on Wednesday, April 17, from 8 am to 2 pm. Taquitos Taco Truck will be onsite from 11 am to 2 pm. The recycling drive will be held at the IBS building at 950 Michigan Avenue. View additional event details here.